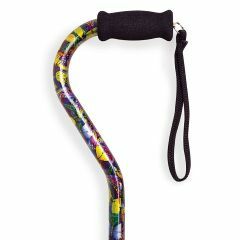 The Offset Aluminum Cane is height adjustable and has a hypalon soft grip with wrist strap. It is very stylish and has a very attractive Butterfly painted finish. Supports Weight. Lightweight. Well Constructed. Safe. Easy To Use. lovely. Indoors. Long Distances. Short Distances. Outdoors. Wet Weather. I have sound the cane to be of great help to me. I have rheumatioid arthritis and Neuropathy, so have very poor balance. This lovely cane has made me much steadier and helps keep balance. IT came promptly, was a good price and is very pretty. Thanks so much. Safe. Supports Weight. Well Constructed. Stores Easily. Easy To Use. Lightweight. Outdoors. Long Distances. Indoors. Wet Weather. Short Distances. I just started using a cane under doctor's orders. The colors and style make me want to walk with a cane. I color cordinate my clothes to match my outings. I get many compliments. Offset Aluminum Cane A good buy! Lightweight. Safe. Well Constructed. Easy To Use. Supports Weight. Stores Easily. I feel much safer walking with this product. Safe. Supports Weight. Well Constructed. Lightweight. Stores Easily. Easy To Use. The cane is very attractive (butterflies :)). I like the fact that it is lightweight. This is my first "off set" cane, and I am extremely pleased with it. Also, I like the cushion hand grip, which not only is comfortable, but keeps the cane from sliding off the counter onto the floor when shopping.